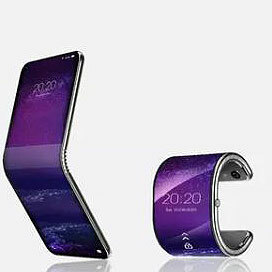 A new foldable smartphone patent from TCL shows a device flexible enough to fold into a smartwatch. The TCL patent explores several different flexible displays, including a pair of tablets—one that folds like a clamshell and one with the display on the outside—and a pair of phones that fold inward or outward along the horizontal. The standout design, however, is for a tall, narrow smartphone able to fold into a cuff that will fit on the wrist, offering a wearable smartphone that doubles as a smartwatch.